At the end of September, it was announced that the formats of the All-Ireland championship and the provincial championships, are going to change radically next year. This article aims to explain how this new format will work, and will try to answer the question: Is it an improvement? The provincial championships are being replaced by round robins, followed by finals. Each province will have five teams: Munster, as before, will comprise of Clare, Cork, Limerick, Tipperary and Waterford. Leinster, which previously consisted of a four-team round robin followed by knockout stages, now contains only the five teams who had been seeded for the 2017 knockout stages; Dublin, Galway, Kilkenny, Offaly and Wexford. The Leinster round robin has been replaced by a ‘Tier two’ competition, creating a tier between the teams in the provincial championships, and those in the Christy Ring. It contains six teams, who were last year’s Leinster round-robin teams, plus last year’s Christy Ring finalists: Antrim, Carlow, Kerry, Laois, Meath and Westmeath. In each of these three groups, each team will play one game against all the others within its group. In Leinster and Munster, there will be two home and two away games for each team. This is a particularly big deal for Galway, who previously did not get any All-Ireland home games, a stipulation of their playing in Leinster. Following the round robin stages, there are four knockout rounds: The preliminary round, the quarter-finals, the semi-finals and the final. The preliminary round is played between the top two tier two teams, and the third place team in each province. The winners of this round play the provincial runners-up in the quarter finals, the winners of that round play the provincial champions in the semi finals, and the finals are played between the semi final winners. The first image above shows a sample of the group tables: the top two in Munster and Leinster go into the provincial finals, while the top two in Tier two, and the third place team in Munster and Leinster, progress to the first knockout round. In this scenario, Antrim would be promoted to Leinster in 2019, while Offaly would go down to tier two. The second image shows the knockout stages of the championship. As before, the provincial winners go through to the semi final, while the provincial runners up go through to the quarter final. So, is it a better format? ‘Better’ is obviously a subjective term, as everybody wants something different out of their championship, and many people saw different things as being what was wrong with the previous format. One way we can measure the quality of the new championship in an objective manner is to look at how fair it is. In the old format, in this scenario, a team starting in a Munster semi-final would have a 25% chance of winning Munster. A team starting in the Munster quarter-final would have only half that chance, at 12.5%. The odds of winning Leinster work similarly, where the semi-finalist has a 25% chance, the quarter finalists have 12.5% chances, and teams in the Leinster round robin would have only a 6.25% chance. We haven’t even gotten out of the provinces, and the odds are already massively skewed! 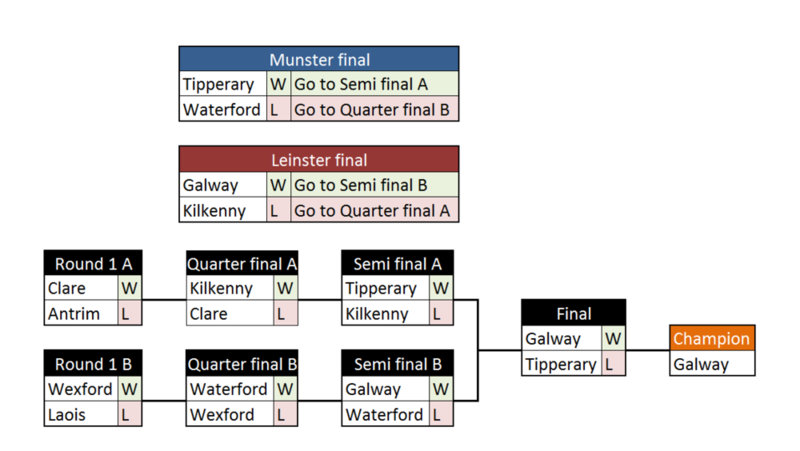 The Munster teams also have a slight advantage to reach the quarter finals over the Leinster teams, as the Leinster teams risk being the ones drawn to play a preliminary round against the Christy Ring champion (who we’re assuming are also equally good in this scenario). By the time we reach the end of the championship, we have multiple tiers of teams, where teams in the best position (the Munster semi-finalists) have 56 times the chance to win the All-Ireland as the team in the worst position (the team qualifying through the Christy Ring). Even ignoring the Christy Ring or Leinster round robin teams, a Munster semi-finalist is still 1.6 times more likely to win the All-Ireland than an equally good Leinster quarter-finalist. Now let’s look at the new format under this scenario. Already, the provinces look better; each team is equally likely to win their province, both in Munster and in Leinster. This is a good start. However, it soon becomes skewed, with the introduction of the tier two teams: these teams are 4.2 times less like to be the All-Ireland champions, or be in an All-Ireland final, as those playing in either province. This is because the top two teams in both Munster and Leinster will go to the quarter or semi-finals, with only the third place team reaching the first knock-out round, while the top two teams in tier two must go through this first knock-out round to progress. This is a massive improvement for teams like Antrim or Carlow, who played in the Christy Ring last year, but a slight disimprovement for those in the old Leinster round robin; teams moving from the Leinster round robin last year to tier two this year go from having a 3.40% chance at being champions to a 2.08% chance. The above graph shows the odds for different seeding options in the 2018 format. Immediately, two things are clear: there are fewer strata, and there’s slightly less variance than before. The former is definitely a positive, while the latter is an improvement, but is still largely unfair; the tier two teams really end up being second tier citizens. Realistically, though, since we live in a world where all the teams are not equal, this is probably an improvement for the tier two teams: At least two of them are guaranteed to be one game away from a quarter final, while previously they would have had to go through two or three rounds after getting through the Leinster round-robin or Christy Ring. The provincial championships of Munster and Leinster are now considerably fairer, and there is no longer an inherent, permanent advantage from playing in Munster vs Leinster, in terms of odds of becoming All-Ireland champion. However, the odds of demotion still put Leinster at a disadvantage: Five out of the six tier two teams would progress to Leinster if they won, which means that in an equal scenario, the worst team in Leinster would be demoted to tier two five times out of six. If Kerry won, they would also have to win a playoff game against the worst Munster team. This means that 83.33% of the time, a team in Leinster would be demoted, versus this only happening 8.33% of the time in Munster. If Kerry got demoted, then it would be impossible for a Munster team to get demoted. This means that there is still a degree of unfairness in the provinces: however, as Kerry previously played in Leinster, it still at least allows for some future change in Munster, at least in theory, rather than assuming it’ll be static forever. Realistically though, this is bad news for Kerry, who have far less of a chance of promotion when compared to the other tier two teams, and simply starting in Leinster or Munster provides a large advantage over starting in tier two. Another measure of whether or not the new championship structure will be better is the number of matches. Whether more matches is better or worse depends on your point of view, of course; many fans will enjoy the opportunity to go to at least 4 games a year (including 2 home matches), instead of the previous guarantee of only 2 (with no definite home games). On the other hand, many clubs are dubious about the claims that the new format will make things easier to schedule, due to its more predictable and rigid structure. Barring replays, each team in Munster and Leinster will have a minimum of 4 games, and a maximum of 8. Each team in tier two will have a minimum of 5 games, and a maximum of 9. A total of 42 matches will be played in total across the competition (Munster, Leinster, Tier two and All-Ireland knockout included). In the old format, and barring replays, Munster teams could have 2 to 7 games, Leinster teams (not in the round robin) could have 2 to 8 games, and Leinster round robin teams could have 3 to 11 games. A team playing in the Christy Ring could also have 3 to 11 games, as the winner went on to the All-Ireland preliminary round, thus opening up the possibility of a Christy Ring team also playing every round of the All-Ireland knockout stages. A total of 28 matches were played across the competition (Munster, Leinster and the All-Ireland only, excluding the Christy Ring) in this format, from April to September. This huge difference in the total number of games definitely gives clubs reason to be cautious: though the new format makes it easier to predict when teams will be playing, and even though the old system was notorious for leaving counties with long gaps between matches that held things up for the clubs, it’s still expected to be very difficult to add 50% more games to the championship, especially since the GAA has also pledged to keep April and September free, running the championship from May until August. However, it is undeniable that it will make scheduling easier and fairer: Last year, the team drawn in the Leinster semi final had to wait for the three quarter finals to conclude, who in turn had to wait for the Leinster round robin to finish up. Munster, despite having fewer games, would have to slow down to prevent its teams from waiting for months for the knockout stages to begin while Leinster and the Christy ring tournaments finished up. Provincial finalists would have to wait for 3 to 4 other knockout stages to conclude before they’d get their next game, while those coming through the back door were expected to play week on week without a break. The new system improves this massively: All three round robins can occur simultaneously, with Munster and Leinster taking exactly the same amount of time. Tier two has an additional round of matches, but this is still less added time than the old Leinster round robin added. This would leave everybody on the same page at the same time, with more balance between how frequently all teams are playing. Depending on how the fixtures are organised, this may still not be enough for clubs, who may need more time to organise their own competitions, but it at least gives them a much better idea of when they definitely can and when they definitely can’t run their games, without risking overlap. So, is it a better system? Overall, it probably is. Teams get more of a fair chance, and it’s more likely that the best teams in Munster and Leinster will go through to the provincial finals, rather than the teams with the best seeding. 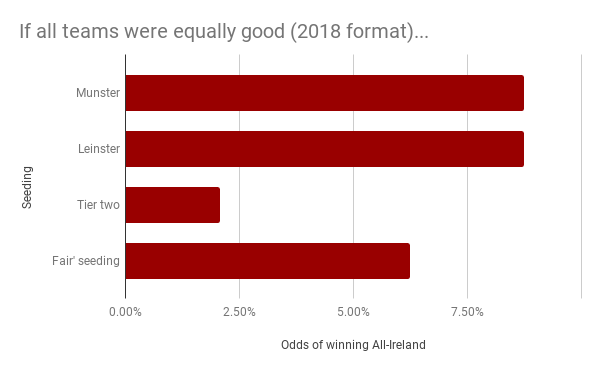 There is still a gap in odds of winning the All-Ireland, depending on if you start in tier two or a province, but realistically the teams at a disadvantage are only those who are unlikely to win anyway, rather than higher quality teams in Munster and Leinster. If a team in tier two improves, it can gain promotion to improve its odds next year (although Kerry may have difficulty with this) Though there are more games, more simultaneous games are possible, and so it’s likely that the promise to have certain parts of the calendar reserved for clubs will be fulfilled. Is it a perfect system? No. The GAA has long had issues with the uneven nature of the provincial championships, and not just because of the different number of counties: Connacht was done away with entirely, since only Galway were really competitive, and Ulster has been made into its own, separate tournament, due to its best teams only being average to fair quality most years. Munster and Leinster both have good teams, but both provinces are not balanced. As it stands, the teams who will play in Munster currently have a much higher average and median BAINISTEOIR rating than those in Leinster, and a smaller standard deviation. Therefore, it’s going to be much harder for a team in 2018 to qualify in Munster than in Leinster. This could also flip, if Munster declines or Leinster improves. Obviously, tradition would prevent the Munster or Leinster championships from going away anytime soon, but as long as they exist, they will likely prevent the All-Ireland from being entirely fair, to a greater or lesser extent. Aside from this unfairness issue, there is also still the question mark about how clubs will fare under the new schedule. Finally, there is the risk that two teams could play one another three times under the new rules, if they met in their province, the provincial final, and in the All-Ireland final. This could, potentially, lower interest in certain matches. Having said all this, though, it’s worth remembering that progress has been made, seemingly in the right direction. It’s far from perfect, but the complicated and unfair 2017 format was further still.